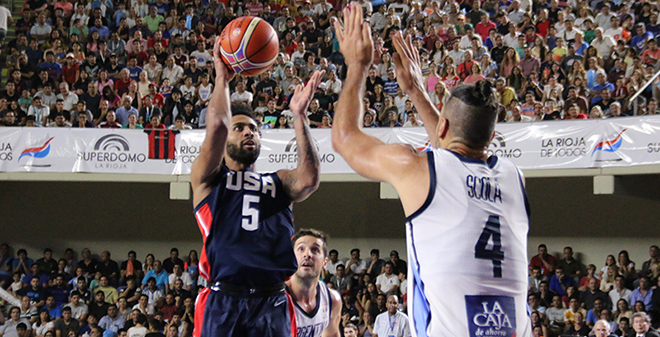 Team USA jumped out to a 12-0 lead at Argentina but couldn’t keep up the momentum in their 80-63 loss. But by the end of the first quarter, Team USA was only up 16-13. The lead was completely gone by halftime. “Argentina is a tremendous team, and after the first five minutes they kicked our butts,” said Team USA head coach Jeff Van Gundy. For the FIBA World Cup, Team USA is comprised on players from the NBA G-League. This difference last night was very simple. It all came down to guard play. Team USA’s guards struggled all night. Joel Barry (South Bay Lakers, North Carolina) picked up back to back fouls early. Both Barry and Travis Trice (Wisconsin Herd, Michigan State) had problems with Argentina’s guards all night. They also had problems getting Team USA into any semblance of an offense. That was indicative by the 15 turnovers with only eight assists. This is in comparison to the 17 assists on 28 made baskets by the Argentinians. There was too much settling for three pointers by the Americans. Whereas Argentina had open three’s off ball movement, frequently for Team USA, it was one pass and shoot or no passes at all. It’s hard to get the offense in a flow that way. When Trice was asked whether it was the shots or the defense he answered “I think it was mixture of both”. It might have been both but the issues weren’t equal in nature. Team USA made it easy for Argentina with very little ball movement and too many forced three’s. At halftime, Team USA was shooting only 31.7% and had already attempted 23 three pointers. What does Team USA need to improve on? We will find out when their head coach finds out. “I’m going to wait to make sure I know what I saw – what I think I saw is really what I did see. I’ll have a better answer for that in a little bit,” said Van Gundy. Team USA stands at 7-2 in Group E. Top three finishing teams from second-round Group E and in Group F, and the best fourth placed team between Group E and Group F will qualify out of the FIBA World Cup.